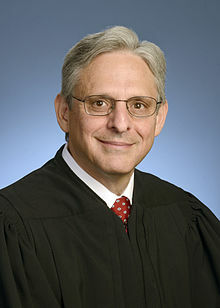 Merrick Brian Garland (born November 13, 1952) is an American federal judge. He is the chief judge of the United States Court of Appeals for the District of Columbia Circuit. He has served on that court since 1997. Garland was born in Chicago, Illinois. He graduated from Harvard College and from Harvard Law School. Garland practiced corporate litigation at Arnold & Porter and worked as a federal prosecutor in the U.S. Department of Justice, where he played a leading role in the investigation and prosecution of the Oklahoma City bombers. In 1995, Garland was appointed to the U.S. Court of Appeals for the District of Columbia Circuit, and (following a delay in Senate confirmation) took the bench in 1997. In 2009 and 2010, Garland was considered by President Barack Obama for two openings on the Supreme Court. On March 16, 2016, Obama nominated Garland to serve as an Associate Justice of the Supreme Court, to fill the vacancy created by the death of Antonin Scalia. Garland has more federal judicial experience than any Supreme Court nominee in history. He is the oldest Supreme Court nominee since Lewis F. Powell, Jr. in 1971. After Republicans refused to give Garland a confirmation hearing, Garland's nomination was expired in January 2017 shortly before the inauguration of Donald Trump. Trump said he will announce his Justice nominee for the Supreme Court on January 31, 2017. Garland married Lynn in 1977. He lives in Bethesda, Maryland. ↑ Sherman, Mark; Holland, Jesse J.; Pace, Julie (April 5, 2010). "Supreme Court prospects are Kagan, Wood, Garland". The Boston Globe. Associated Press. ISSN 0743-1791. Archived from the original on March 14, 2016. ↑ Shear, Michael D.; Harris, Gardiner (March 16, 2016). "Obama Chooses Merrick Garland for Supreme Court". New York Times. ↑ Sarah Wheaton, Josh Gerstein & Seung Min Kim, Obama picks Merrick Garland for Supreme Court, Politico (March 16, 2016). ↑ "Merrick Garland Is The Oldest Supreme Court Nominee Since Nixon Was President". FiveThirtyEight. March 16, 2016.